Thank You for a Year of Big Change! 2018 was a big year. It was a year of unprecedented threats, unbelievable movement building and unwavering support from you, our community of dedicated advocates, friends, partners, and funders. Every report that was written, harmful legislation that was blocked and policy solution that was supported helped us get one step closer to creating a more equitable society for all. We had the opportunity to move the needle on the issues we care about most at Heartland Alliance—Housing, Health Care, Jobs, Justice, Economic Opportunity, and Safety. And we could not have done it without you. Opened Doors to Employment for 26,000 People Experiencing Homelessness: We supported 5 communities in creating innovative changes to public service systems, making the paths to support more accessible and effective. Health Care Preserved for One Million Illinoisans: Heartland Alliance and our partners in Protect Our Care Illinois helped lead the state efforts to save the ACA, deny junk health insurance, protect Medicaid, and fund community health centers. Through multipronged field building efforts, we ensured that stakeholders were equipped with strategies and best practices for addressing the employment interests of people facing barriers to employment. All told we reached over 150,000 people nationwide through our resources, tools, webinars, trainings, and on-site supports. Increased income for nearly 70,000 Illinoisans and worked to protect consumers: In partnership with the Sargent Shriver National Center on Poverty Law and Chicago Coalition for the Homeless, we led the effort to increase the Temporary Assistance for Needy Families cash grant, the first increase in 10 years. We also launched a campaign to cap interest rates on title loans at 36 percent, started coalition-wide meetings, passed a bill ensuring that ABLE accounts are protected from debt collection, and celebrated the launch of Secure Choice, a new retirement savings program for Illinois workers. Increased Opportunity for Over 4 Million People with a Criminal Record: In partnership with the Restoring Rights and Opportunities Coalition of Illinois, we passed legislation to prohibit courts from holding unpaid fines and fees against people looking to seal their criminal records. We also made strides in the movement to “ban the box” on college applications. Heartland Alliance provided education, research, data and analysis support to many organizations, including the Greater Chicago Food Depository, Chicago Coalition for the Homeless, the Secure Choice Board, McCormick Foundation, Avodah, Latino Policy Forum, DuPage County Continuum of Care, Chicago Bar Foundation, City Colleges of Chicago, University of Illinois at Chicago, Rush University Medical Center, Lake County Alliance for Human Services, Strengthening Chicago’s Youth, the Oak Park Community Foundation grantees, the Chicago Resilient Families Initiative Task Force, Early Learning Council, and others. We released the results of five-year evaluation of a major Cook County initiative to implement a workforce management information system. In addition to our work with community partners, we made major strides towards improving our outcomes measurement and data infrastructure for Heartland Alliance programs. Increased Food Security for 40,000 Low-Income Community College Students: With the support of dedicated partners, we expanded the Supplemental Nutrition Assistance Program for economically disadvantaged community college students. Over 1500 Human Trafficking Survivors Rights Protected: Passed three bills to improve the rights of survivors of human trafficking by allowing them to seal any criminal record resulting from their own exploitation, provide access to pay for health care and housing, and makes it easier to help them sue their traffickers. We are proud of the changes and impact we made this year, but we are not done yet. 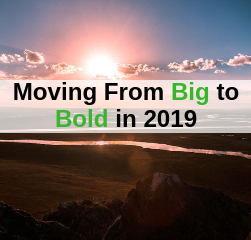 While this year was big, 2019 will bold. We are not just ready to hold the line on the strides we have made but we are ready, and planning, to launch big, bold ideas that will lift up innovative solutions to poverty. These are solutions that will strike at the heart of inequity and put bold ideas, once thought unimaginable, center stage. Thank you to our dedicated funders, partners, and allies—without you, we would not have been able to accomplish this work! We can’t wait to ring in 2019 with you and for you to join us on our journey towards creating an equitable society for us all. Because when we all can achieve safety, opportunity, and equity, everyone benefits.